Gotham City, prepare to face your doom! Meet the vile villains trying to take over Gotham City. Learn all about their vehicles and see them face their greatest enemy, Batman...! 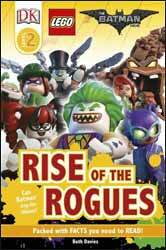 Rise of the Rogues is a Level 2 book from DK in The LEGO Batman Movie series of learn to read publications. It's a "beginning to read" book designed for parents to help their children in the early stages of reading. This release contains 48 pages of fun facts and information about Gotham City and its various residents. And, as the title suggests, more emphasis is given over to the movie's villains. There's a quiz at the back of the book to test your child's memory skills, as well as parent's notes. Overall, this is a fun and entertaining book that will help any little person with their reading skills.